Jan Francke presents paper on variations in radar suitability in UAE aeolian sands at GPR2014 in Brussels. A common misconception in the geophysics community is that radar technology is highly suitable in dry coarse-grained media, such as sands and gravels. Groundradar’s experience in over 80 countries worldwide with GPR is contrary, with radar suitability in sands being a complex function of sand type, groundwater levels, sand provenance, and instrumentation used. 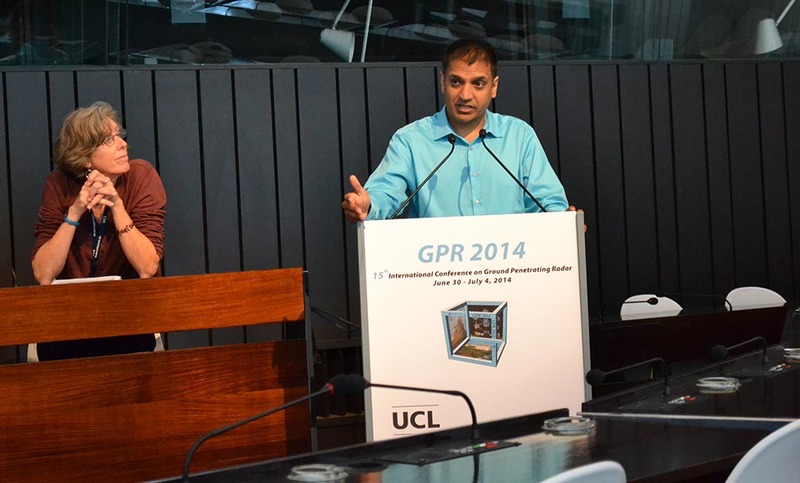 A paper presented at the GPR2014 conference in Brussels examines the extreme variability in penetration and profile resolution evident between dozens of aeolian test sites scattered throughout the United Arab Emirates, collected using the same UltraGPR instruments in the same meteorological conditions. The paper discusses the cause of these variations. On-going surveys are being conducted by Pasinex Resources in Turkey and GroundTruth Exploration in the Yukon. The raw data are being sent nightly to Groundradar in Canada for processing, interpretation and deposit modelling.